Last week when the National Archives released the 1940 census, I couldn’t wait to search for a record of my great-grandparents. Although I have only vague memories of them from my childhood, I grew up hearing inspiring stories about their lives. Many of the facts on the census only confirmed what I already knew. In 1940, census records indicate that Herman and Mabel Matthews lived on a working farm (as did half of North Carolina’s total population in those days), which was located just outside of Carthage in Moore County. At the time of the census, he was thirty-one and she was twenty-eight. They had four children ranging from age one to twelve. Herman farmed tobacco and helped his father run Matthews Market, the local general store. Mabel in the dark blue dress. Herman and Mabel met at a community barn raising as teenagers and married shortly thereafter. In 1927 or so, Herman built their house with his own two hands, proudly chiseling the letter “M” for Matthews on the chimney. They lived there the rest of their lives. As a young couple, Herman and Mabel were just starting their family during the Great Depression, a time in which farmers across North Carolina were in dire straits. The price of tobacco and cotton plummeted, and farmers were only making a few cents on the dollar of each pound produced and sold at auction. In those days, these were the area’s cash crops on which most families’ livelihoods depended. Years of land cultivation for tobacco and cotton meant the nutrients in the soil were significantly depleted, making vegetable gardening a challenge. Families struggled just to put food on the table, and many suffered from malnutrition and illness. The common theme of all the stories I heard growing up was how the Matthews were able to overcome all sorts of trials and tribulations, not just through steadfast faith, resolve, hard work, and frugality, but also and especially through their ties in the community. Modern sociologists have a fancy term for this: “social capital.” I think my great-grandparents simply thought of it as being good neighbors. The word “philanthropist” wasn’t in my great-grandparents’ vocabulary, but they cared about making their community a better place and were very generous with their time and money. Herman helped build Farm Life School so that young people in the community didn't have to walk or ride more than a couple miles to school. He also helped build Yates Thagard Church and later served as a deacon. 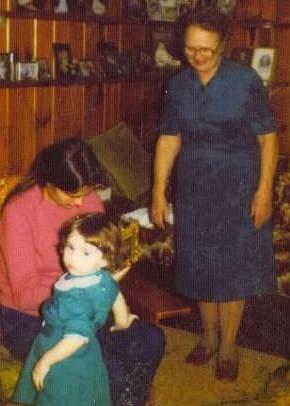 Mabel was the epitome of a traditional Southern lady -- a tireless mother, an excellent cook and a Sunday school teacher at church. She was a lady who showed up at your house with a casserole when you were sick with the flu. As I contemplated the extraordinary lives of my great-grandparents, I began thinking about how the community has changed since their time. While North Carolina’s urban areas are growing at unprecedented rates, rural communities have been left in the dust. Many are struggling. Rapid changes in business and industry, coupled with the loss of manufacturing and farm jobs, means that North Carolina’s rural citizens face higher unemployment rates than the rest of the state. They also face higher rates of poverty and limited access to healthcare. As younger generations are moving to high-growth urban areas in pursuit of higher education, jobs, and opportunity, they are leaving behind a population that is low income, aging and in need of basic services. In fact, I don’t think my great-grandparents would even recognize their community if they were alive today. The culture of the place has changed. I was reminded of a book I read a couple years ago, Harvard professor Robert Putnam’s Bowling Alone: The Collapse and Revival of American Community. In Bowling Alone, Putnam charts the decline of social capital with a decline in community and civic engagement. Putnam claims that our shifting, ever-changing population (one in five people will move in any given year), as well as technological advances such as internet and television (the average American watches 10 hours a week), creates communities in which people are solitary and isolated, less empathetic toward their fellow citizens, and are thus less engaged in civic life and community building efforts. The good news is Putnam offers a solution to revitalizing communities and connectivity with numerous case studies and strategies to improving social capital. Putnam earned his PhD from Yale and has devoted his career to studying social capital, but I think his solutions would have been thought of as just plain common sense to my great-grandparents! It starts with improving connectivity and getting people engaged in community and civic life. This is an important part of our mission at the NCCF. Community foundations offer a vast wealth of resources that can be part of the solution. With its 1,000+ volunteers across the state and its affiliate leadership, NCCF’s affiliates are bringing together individuals, people in the businesses community, educators, and local leaders to tackle community issues such as social activism, poverty, access to healthcare, and education. But this is just a drop in the bucket of what can be done. Each and every one of us should and must have a role in strengthening communities. And helping doesn’t necessarily mean joining a nonprofit board or giving thousands of dollars. Bake a casserole to take to a neighbor. Volunteer to build a playground. Attend a town hall meeting. Vote. Fight to keep essential local services in the downtown area --post office, police station, school, etc. Support local businesses. Organize a neighborhood potluck. In essence, be a good neighbor. When I moved off the farm and came to Raleigh to attend college, I was cautioned not to forget where I came from. I suppose I didn’t give it much thought at the time, but now I realize that this was very important advice I should take to heart. We can each play a role in making North Carolina a better place for all of its citizens, rural and urban. Let’s not forget the legacy of our ancestors, the rural tradition of generosity, of neighbors helping neighbors to get through hard times. Together we can make a difference.